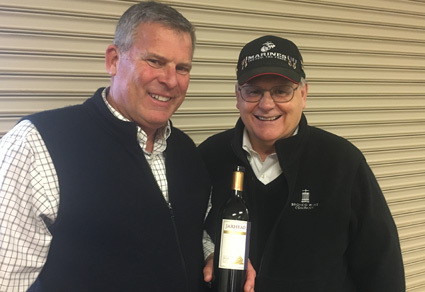 Pictured here is Jarhead liaison Chuck Carlson (at left) with Joseph Franzia, owner of our distributor Bronco Wine Co. / Classic Wines of California, at the company’s recent annual sales meeting in Ceres, California. Joseph served as a USMC Captain of Delta 1/7 in Vietnam and received a Bronze Star and three Purple Hearts. As you can imagine, he his a big fan of our wines, and the feelings are mutual. For Chuck, the meeting was an opportunity to connect with around 70 Classic Wine representatives from around the nation, including those who sell our wines to military bases on the East Coast. He tasted them on our latest releases and filled them in on the latest news in the world of Jarhead Wine Company. Chuck is also a winemaker, so he was able to share details about our vineyards in Santa Barbara County. A new year is upon us, and a meeting like this makes sure that our wines remained deployed as far and wide as possible!